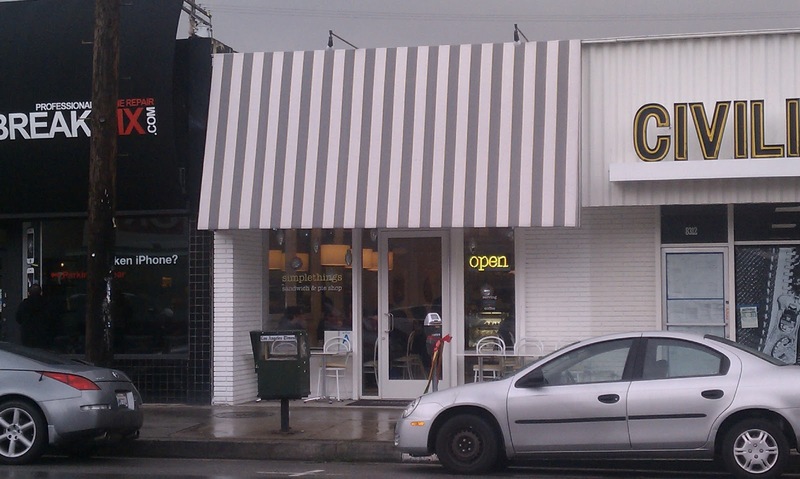 Simplethings sandwich and pie shop opened up Thanksgiving week in a spot on West 3rd Street in West Hollywood. The menu lives up to the name of the restaurant with sandwiches, pot pies, salads, soups and sweet pies dominating the menu. I had seen favorable reports from Zach of MidtownLunchLA and Esther of E*Star LA and over the holidays decided to check it out for lunch to see for myself. My dining companion and I split a bowl of roasted tomato soup, the thanksgiving sandwich and the steak and lager pot pie. The roasted tomato soup ($3.50 for a cup, $5.50 for a bowl) was generously portioned, piping hot and delicious. This was the perfect thing to warm up on a cold day. The crouton in the soup was also nice and crunchy and then got wonderfully soggy. 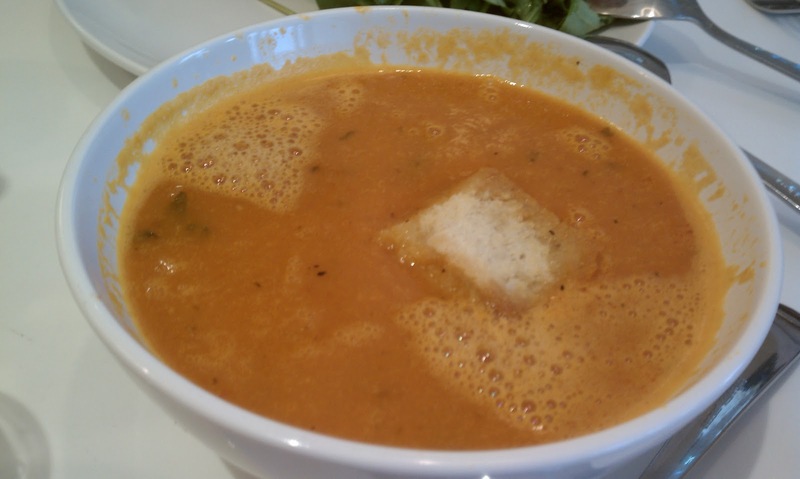 The soup was not overly rich or creamy, rather simply tasting of roasted tomatoes. 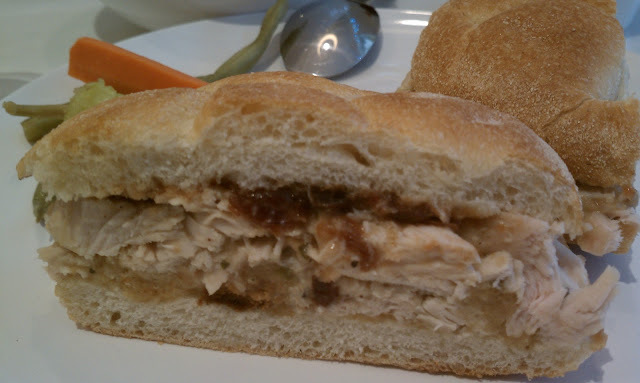 stuffing, sage gravy, michetti roll) brought back the holiday meal to my plate all in one sandwich. Hearty and flavorful. The cornbread stuffing had some heft and the jalepano gave it an extra boost plus the roll was not overwhelming (a pet peeve is when the bread completely dominates a sandwich). I will be back for the half sandwich and soup deal (only $10) and as much as I want to explore the menu further I suspect I will stick with the tomato soup and the thanksgiving sandwich, as they were such winners. 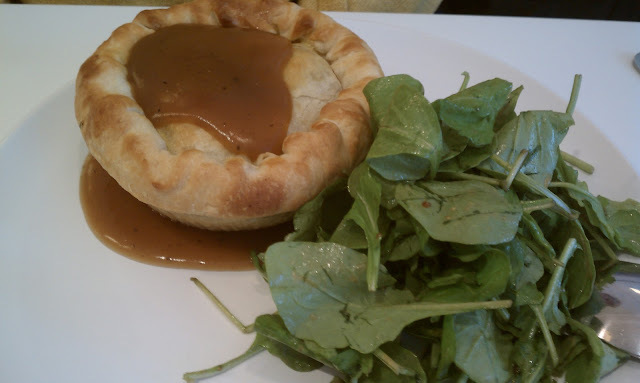 The steak and lager pot pie ($10) was good but not as strong as the other dishes. As my dining companion put it, the flavors were great and spot on, but the consistency was less appealing. I enjoyed it more than she did but still felt the Thanksgiving sandwich won the savory derby at simplethings. I have not yet tried the pies, which come in three sizes: cutie pie (a bite), simple pie (a large slice) or big pie (full size) and each day a rotating selection of six of the fourteen varieties are on offer (see website for the pie schedule).